with complete, original documentation and set presentation intact from its purchase from the exposition's Coin and Medal Department in 1915. A complete, five-piece set of the coins issued to commemorate the Panama-Pacific International Exposition in 1915 was certified by Numismatic Guaranty Corporation (NGC). Consisting of the silver half dollar, the gold dollar, quarter eagle and both the round and octagonal 50-dollar pieces, this fabulous set is completely original, having been kept intact since it was purchased from the Exposition's Coin and Medal Department in 1915. The set includes its presentation box, which is white with gold lettering on the cover reading: PANAMA-PACIFIC INTERNATIONAL EXPOSITION COMMEMORATIVE COINS 1915 SAN FRANCISCO, USA. Inside is a black, velvet-lined tray with individual depressions in which each of the five coins were formerly housed until being graded and encapsulated by NGC. 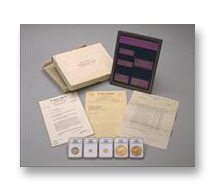 The tray is framed in metal, and a purple label with gold lettering that describes the respective coin accompanies each of its depressions. Adding to the rarity and desirability of this set is its original bill of sale and subsequent documentation tracing its pedigree through just two owners. Because they've been protected within this case for more than 80 years, since being struck by the San Francisco Mint, each of these coins is in extraordinary condition and displays bright, satiny luster. NGC has graded the 1915-S silver half dollar MS-66. Richly toned, this lovely coin is of the variety featuring a distinctly re-punched mintmark, Breen-7432. The gold dollar grades an amazing MS-67. The quarter eagle merited an impressive grade of MS-66. Rarest of all the Panama-Pacific coins, especially in high grades, are the massive 50-dollar pieces. The specimens included in this set are both gems. The round edition, of which just 483 were issued, is one of the finest certified by NGC. The distinctive octagonal specimen, with a net mintage of only 645 pieces, was certified by NGC as MS-65. This wonderful, original set was purchased at the issue price of $200 by an Oswego, Kansas resident named Robert O. Deming. The sale was recorded on the Coin and Medal Department's invoice number 565, dated July 29, 1915 and signed by the department's chief, famed numismatist and hobby promoter Farran Zerbe. The set was later acquired by its most recent owner from famed Texas dealer B. Max Mehl, who had just bought it from the original purchaser's son. In a letter dated June 8, 1940, Mehl informed the prospective buyer of this set's availability at a price of $575. "In examining this set you will find the original purchase order, proving that this set has never changed hands since its original purchase in 1915. I secured it direct from the son of the original owner. 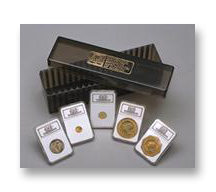 As you know, these sets in cases have sold up to $650.00, and I have seen one advertised at as much as $750.00. This is the cheapest price I have ever sold a set for at private sale, but I have just bought it and am willing to turn it for a very small margin. But if for any reason you do not care for it, do not hesitate to return it at my expense." Mehl remarked on the invoice, "Very rare, as only about twenty-five (25) such sets were made and sold." The sale was in fact consummated, and this set was held by the collector until very recently, when it was sold to Rare Coin Company of America (Rarcoa). The proceeds of this sale have been donated by the set's former owner to a college of his choosing. Speaking for Rarcoa, President Ed Milas remarked: "In my 40 years in the coin business, I've very rarely seen a set like this that's so original and well documented. Its condition and the fact that this set has had so few owners is something I seldom encounter these days. I'm really pleased that I had the chance to handle an original Pan-Pac set of this quality." NGC President Mark Salzberg was equally enthusiastic about the set: "This spectacular, original Pan-PAC set brings together stunning beauty and outstanding condition. It's a treat to see coins like these individually, but in an original set with full documentation this is a truly inspiring reminder of why we collect coins."